Just a few weeks ago, IEEE Spectrum wrote about an artificial compound insect eye that was developed by a group of researchers based in the United States. Not to be outdone, a group from EPFL in Switzerland has announced their own artificial compound insect eye, and we got a hands-on a few weeks ago in Lausanne. Generally, we like to make camera systems that work like our eyeballs do. And that's fine. But in a lot of ways, human eyeballs are terrible. The most successful class of animals ever, the arthropods, have gotten along just fine with compound eyes for a very long time, and the most sophisticated eyes of any animal are of the compound variety (belonging to our friend the mantis shrimp). So obviously, compound eyes have something going for them, which is why researchers in general (and roboticists specifically) are so keen on developing their own versions. The eye to come out of EPFL this week is unique because it offers a huge insect-like field of view, very fast performance under all sorts of lighting conditions, and most notably, it's mechanically flexible: at just 1 mm thin, you can bend it into different shapes. Image C shows the eye from an extinct species of trilobite, while Image D shows the eye from a fruit fly. Both the real and artificial eyes offer a horizontal field of view of 180 degrees, and they consist of a similar number of pixels. However, the artificial eye is significantly faster, operating at up to 300 hertz, while a fruit fly only updates at 100 hertz. Take that, nature! It's important to note that these aren't the sort of cameras that you'd want to use to take pictures. What they're best at is sensing movement, or to be more specific, sensing changes in the intensity of light generated by motion. It doesn't sound like much (and it doesn't look like much, either), but it's how bugs navigate and avoid obstacles, and as anyone who's ever tried to swat a fly can attest to, it works rather well. It also works indoors, outdoors, in bright sun, and in shade (or even moonlight), and has no trouble adapting to abrupt transitions between any of these states, which is something that conventional cameras are lousy at. Going forward, we expect to see this tech integrated into robots, and there's also the potential for it to show up in lots of other applications. If it can be made inexpensively enough, we could end up with something like "imaging tape" that could be integrated into smart clothing, to provide a self-contained way of detecting distances to objects. Why? Because why not, that's why. But seriously, flexible sensors like these have the potential to enable all sorts of new applications that have been impossible until now, and we're excited to see what happens. 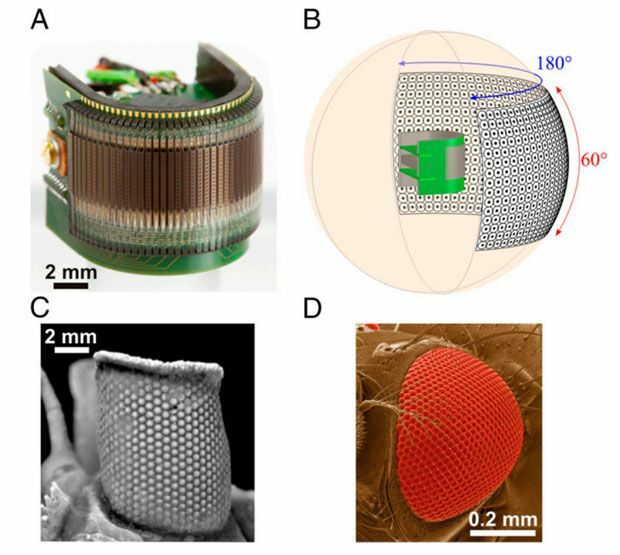 "Miniature Curved Artificial Compound Eyes," by Dario Floreano, Ramon Pericet-Camara, Stéphane Viollet, Franck Ruffier, Andreas Brückner, Robert Leitel, Wolfgang Buss, Mohsine Menouni, Fabien Expert, Raphaël Juston, Michal Karol Dobrzynski, Geraud L’Eplattenier, Fabian Recktenwald, Hanspeter A. Mallot, and Nicolas Franceschini, was published today inProceedings of National Academy of Sciences. Special thanks to Dario Floreano and Ramon Pericet-Camara for showing us these eyes at EPFL. Great new technology! I'll keep my eye on it. This would be perfect for a couple Micro Helis I have!!! I hope the technology becomes affordable someday soon. We've got eyes already. We need wings damn it! One of our biggest problems in dealing with machines is anthropomorphism. Thinking that our machines ought to act, sense and "think" in the same way we do. Machine vision is one of the most important attributes where this fallacy has been pursued. Nice to see a bit further out of the box. Nice! looking forward for massive and cheap production. Brad...what we need is the power system. Think of a bee compared to a micro-quad in terms of energy efficency. Watch the video at http://www.curvace.org/ The resolution has much to be desired and the bot it is attached to for the optic flow based avoidance bumps into the wall head on. But I remember when digital "camera" sensors had a resolution of 1024 pixels (0.1 megapixel) were $5000 (and not so long ago really), so no telling how fast this will evolve and become practical. 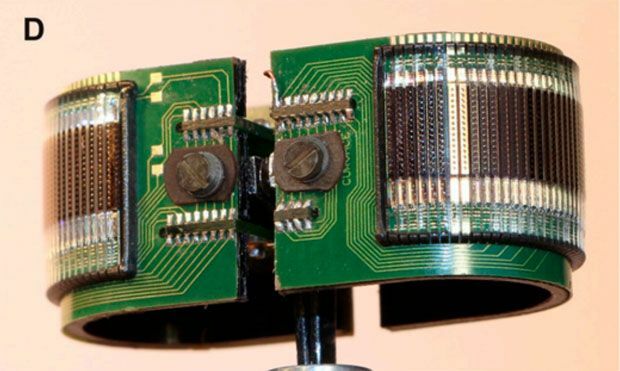 Still, I wonder if the omnidirectional lenses (like on top of roomba) with simple camera and using or few cogs in the 64 cog parellela processor would not be more cost effective for the near term.